Action camps are a popular summer activity in Germany for families and activists young and old alike, and this summer saw arrests related to camps focused on nuclear weapons, uranium transport and combat training. The nuclear power industry is dying a slow death. Still its uranium lifeblood courses around the globe from the mines to the mills, on through a handful of commercial enrichment plants and then fabrication into fuel rods for reactors. Participants in this summer’s anti-nuclear action camp in Kiel during the week of August 9-16 put the spotlight on this still-profitable global circulatory system by monitoring, inspecting and blockading shipments of yellowcake (uranium concentrates) en route to the French processing complex in Narbonne. The mere presence of the camp was thought to be the reason a ship hauling registered containers of yellowcake from Uzbekistan did not enter the North–Baltic Sea Canal at Kiel, instead sailing for two extra days around Denmark towards Hamburg. The port at Hamburg is an international hub for nuclear-related transportation, with almost 200 known shipments into the port in 2013. A series of safety issues – including last year’s huge, potentially catastrophic fire on a ship carrying yellowcake and explosives – led to a brief suspension of nuclear shipments earlier this year. Heightened inspections have since revealed deficiencies in more than half of the controlled transports. When the Uzbek uranium did arrive in Hamburg on August 13, anti-nuclear port-watchers discovered that contrary to government assurances given to the Hamburg Senate in July, four containers with uranium from Kazakhstan that arrived with expired registration remained in view at the port, and had not, as promised, been shipped on to France right after re-inspection. Activists then launched an inspection of the entire C. Steinweg container shipyard on August 15, counting 51 uranium transport containers where only the 30 Uzbek ones were expected. Some were from Namibia, as well. When shipyard owners realized the citizen inspection was underway, they called police, who responded with dogs and a helicopter. Several people were injured as they were apprehended, and trespass charges will proceed if Steinweg pursues a complaint. On the morning of August 18, two days after the end of the camp, a train pulling 50 uranium containers departed the Hamburg-South station. It soon came to a stop where two people were locked together inside tubes placed under the rails. Another pair of activists locked themselves together under a rail behind it. The shipment was stalled for over four hours while police cut through the locking devices and arrested the blockaders. 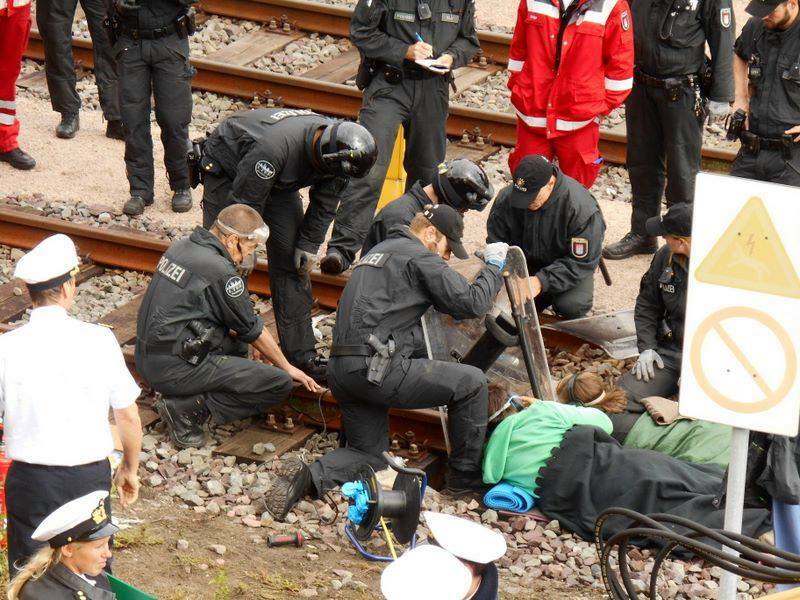 Prosecution of activists arrested during last summer’s camp at the blockade of the nuclear fuel fabrication facility in Lingen has only recently begun. For more information visit antiatomcamp.nirgendwo.info. The modernization of U.S. nuclear weapons also involves upgrading bases and aircraft that would deliver the weapons under NATO nuclear security agreements, including at the Büchel air force base in Germany. At this year’s protest and action camp, August 2-11, the Youth Network for Political Action initiated the first blockade of three base gates on the morning of August 5, intending to remain at least 24 hours until the hour of the Hiroshima bombing. Police did not interfere until early in the morning on Hiroshima Day, and then to clear just the Lutzerather gate. A dozen blockaders were cleared away, and most only had their IDs checked at the site. Two who did not carry ID were taken to the station, as was the last man cleared from the blockade. He had locked his neck to the iron bars of the gate and police carried him along with the opening gate out of the way before cutting the gate to free him. All three were charged with coercion, and others received notices from the police in the mail. Campers lifted the blockade of the other two gates mid-day. Alleged internet posts about terrorists intending to strike Büchel began to circulate that afternoon. Police and army activity increased through Thursday until the threat was revealed as a hoax. After a day of collecting signatures on a petition to send the Büchel nukes back to the U.S., campers returned to block the gates again early Friday morning. Police quickly carried enough people away to clear one lane, and no one was taken into custody or charged. The blockade was soon lifted. Police did not interfere with the Nagasaki Day memorial at the main gate nor a concert given there that concluded the camp on Sunday. For more information, visit buechel-atomwaffenfrei.de. Tents were pitched for the War Starts Here action base camp on August 17, just outside the boundaries of the sprawling European Battle Simulation Center at Altmark, Germany. Despite a large military presence patrolling the 175-square mile site, over the next week groups of campers entered on three different days. On August 19, 50 people walked over a mile to establish the first camp in the area of the former village of Päxforde, noting the Latin root for peace in the name as indicative of their goal. Police soon caught up and removed the campers from the range. The next day, 30 people pitched tents on the main tank road through the area. Police were marching them back down the road when part of the group suffered temporary exhaustion, and in their repose again blocked the road! Three days later, 60 people embarked on a colorful parade under the eyes of police, and established their peace village on a beautiful heath inside the war games area. It took police working in the rain until the next day to roust them all from the grounds, record their IDs, and send them off. For more information, visit gewaltfreie-aktion-guez-abschaffen.de.